The PCE-RE60 Pt 100 temperature regulator is used in those places where it is not possible to install a temperature regulator in a panel. The PCE-RE60 Pt 100 temperature regulator is strip mounted (standard: 35 mm), therefore it can be installed in any electric cupboard. PCE-RE60 Pt 100 temperature regulator can be connected to different resistance thermometers. The measurement range depends on the sensor and it can be adjusted by means of temperature regulator keys. The PCE-RE60 Pt 100 temperature regulator is adjusted by means of "Power on/off". P, PD or PID regulation. The adjustments are performed in the device itself. Main parameters are shown in the display of the PCE-RE60 Pt 100 temperature regulator. The PCE-RE60 Pt 100 temperature regulator has a regulation relay (which can be powered with 5 A) and two alarm relays. The PCE-R60 Pt 100 has a default built-in alarm relay. 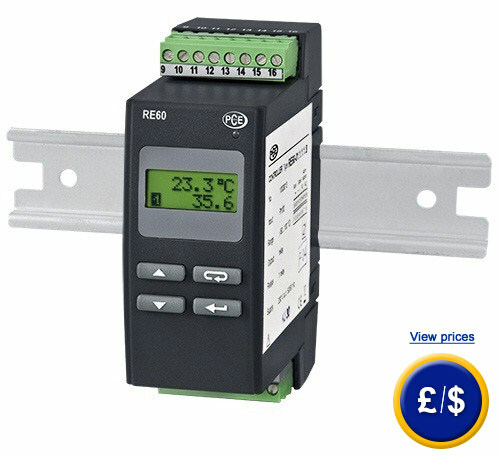 At the following link you will find an overview of the temperature regulators available at PCE-Instruments.